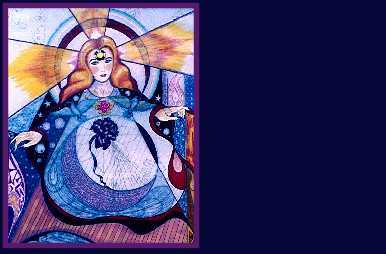 This is a Divine Feminine theme coordinated web page set. I suggest using this navy blue colored text as shown. Above you see a blank title graphic for you to insert a web page title on. If you don't have a graphic program capable of doing that, e-mail me and I will do it for you as time allows. Below you will find the clip art divider and bullet designed for this page. The button images designed for this page also are linked for this site so that you can navigate through it. All of the Divine Feminine graphics are included in the .zip file below. Type used for buttons called "Kelly Ann Gothic." If you would like to see a larger version of the graphic I drew for this design, click here. The original is pencil on mylar and aproximately 30x24. To save, you may download the .zip file which includes the Divine Feminine graphics, clip art, instructions and HTML template. Do not link to the graphics on this page! Please note that this set is free to use on personal websites only (donations are always appreciated). Those sites that hope to generate income (business site) there is a one time $10 minimum requested donation payable through Pay Pal. Divine Feminine web theme set courtesy of: Crystal Cloud Graphics.